Carl Natale is a recovering journalist who blogged for newspapers before it was called blogging. Now he covers technology as a freelance writer. Dropbox is one the most useful tools that I use. Being able to easily access files from any computer is a must for anyone who works remotely, but it’s good to have alternatives to Dropbox sometimes. One of those alternatives is SugarSync. At first glance, it looks like it can do a better job than Dropbox. However, there are a few issues that may have you think twice. After installing the SugarSync Manager, I chose which folders I wanted to sync. They also let me choose subfolders to sync or exclude. Within minutes I had an online backup service, and those files were accessible by any computer I synced my SugarSync account with. For those of you who prefer the idea of a special folder for sharing files, SugarSync installs the Magic Briefcase on your computer to make that happen. Use this to quickly store files accessible by all your computers or colleagues, or at least that’s the theory. It doesn’t work so well on Android. First, adding a file isn’t easy. I have to find the file by navigating the SugarSync app through the phone’s directory structure. Although, I almost am willing to call that a cool feature. Using SugarSync, I can find any mobile file, but sharing files should be easier than that. For example, I use the vRecorder app to record audio on my phone. From within that app I can easily send audio files to my Dropbox or Google Drive accounts, but there’s no SugarSync option. Second, I can’t get anything in my Magic Briefcase to travel between my phone and computer. I was able to move an audio file into the Magic Briefcase on my phone, but I can’t access it on my computer, and vice versa. A text file I loaded from my laptop to the Magic Briefcase won’t appear on my phone. Despite some annoyances with Magic Briefcase, I am able to access its files via the website, and the Android app is able to access the laptop folders that are synced with SugarSync. This is a handy way to access all kinds of files, and I can even sync Dropbox files that are stored on my laptop — what Dropbox saves on my computer is saved on SugarSync. It’s not real-time, but it’s a legitimate backup. Mobile apps for iOS, Android, Blackberry, Windows Mobile, and Symbian. 5GB free with 30GB, 60GB, 100GB and 250GB upgrades available. WebSync app, which lets you edit files in the cloud. Automatic photo uploads, which (for what it’s worth), Dropbox can also do using the regular camera app. Not being able to quickly and easily sync a file generated by my phone is a major shortcoming of SugarSync. Even if it’s due to user error, I’m not happy with the Magic Briefcase. Dropbox makes it very easy to do and sets the bar extremely high in this case. However, depending on any one service is a bit risky, especially if it’s free. It’s good to have other options readily available when a web service goes down, and SugarSync can fill that void — just don’t expect it to be anything fantastic compared to your go-to cloud service. 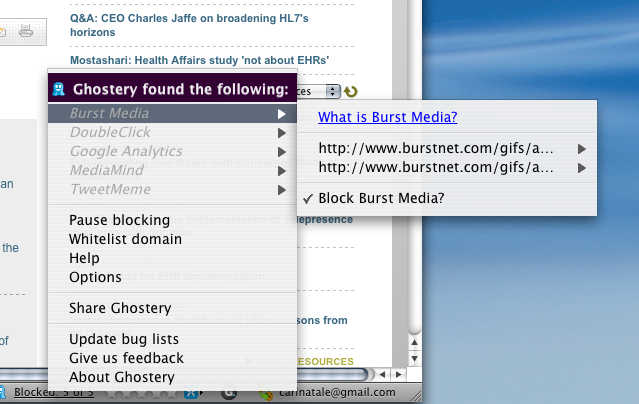 Ghostery shows you who is tracking you and let's you stop them. Browser cookies are the black helicopters of the Internet age. Everyone seems to believe they’re only used for a secret, evil purpose. 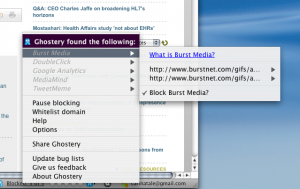 Ghostery is a free browser add-on that exposes who is tracking your behavior and allows you to block them. It is available for Firefox, Safari, Google Chrome, Opera, Internet Explorer and Apple iOS. That’s right – you can use it on your iPhone. When setting up the add-0n, it’s easiest to go with a broad brush by blocking all third-party extensions and cookies. It doesn’t seem to do any harm (depending on your definition of harm). For example, it blocks almost all the social media sharing buttons you see on web content. So if you use them a lot to “Like” pages, tweet stories and add to social bookmarking services, you’re going to miss them. But it’s easy enough to allow the functions you want by clicking on the ghost icon at the bottom of your browser. That will bring up an info box that tells you what is blocked and lets you unblock it. You can also click through to get information on the service that is tracking your behavior. That window also lets you temporarily turn off the blocking. Once you do that, Ghostery still identifies the trackers and gives you the same information. One of the benefits seems to be increased browser speed. 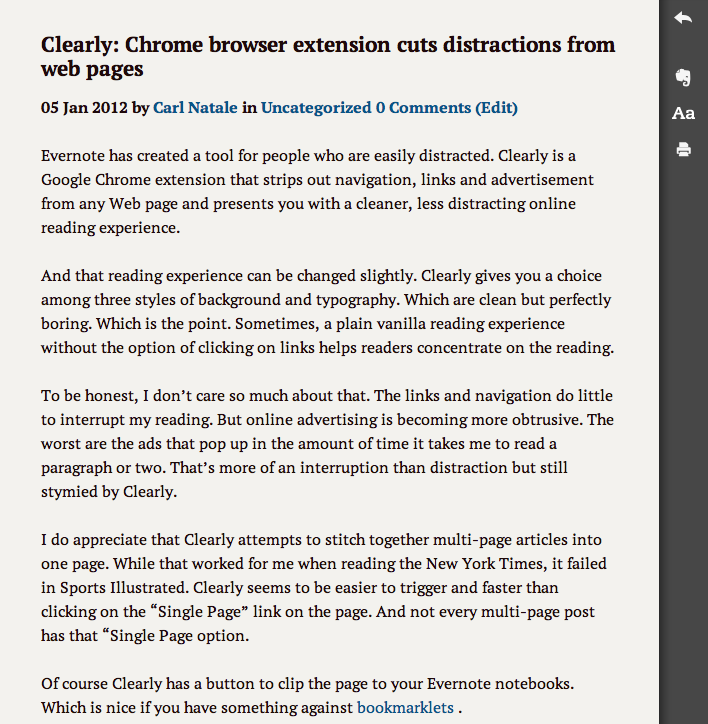 Sometimes the blocking takes time but overall pages load faster without the third-party extensions. Another casualty is advertising. Some ads are blocked. Sometimes the space is there but no ad can be seen. Annoying pop-over ads still appear but don’t show any advertisement. I still have to close out the ad space to continue reading. Other than that, I don’t seem to be missing any functionality, except my online banking site seems to be glitchy while Ghostery is blocking trackers. Pausing the blocks lets me do what I need to do though. 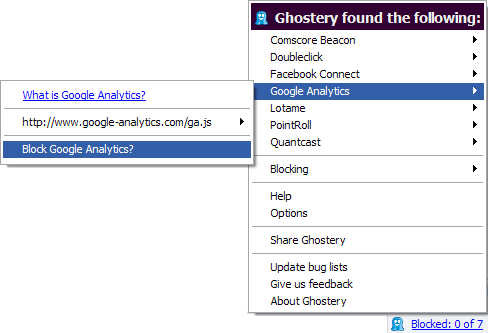 First, Ghostery can block your analytics – Google Analytics and Omniture for example. That means your stats could take a hit even if you’re only tracking traffic to pages not who is reading them. Second, if you run a metered paywall – a limit to the number of pages that can be viewed for free – Ghostery can let readers bypass those limits since they rely on information in cookies. But it doesn’t break down paywalls that protect certain pages. I don’t need a tin foil hat anymore. The add-on makes me feel invisible to all kinds of tracking. Since not all of it is evil, I have the ability to accept the services that I want to use. It’s easy to use and worth the time to install. There’s another free productivity tool that harnesses the power of simplicity. 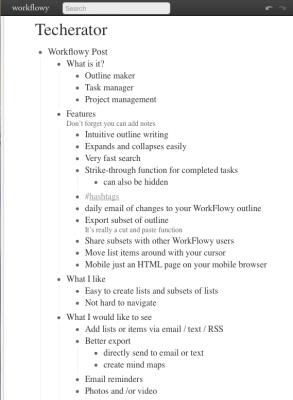 WorkFlowy is probably the simplest, most powerful web app you will find. Basically it’s a list maker that can be used as a task organizer and project management tool. To use it, just start typing. Automatically you’re creating a bullet point. Press “return” and you have a new bullet point under it. Press “tab” and that line becomes a bullet point and your original line becomes a heading. Keep pressing “return” to add more bullet points. Expands/collapses easily: Each user only gets one page so the ability to collapse all the sublists and expand by clicking on a bullet makes the mass of text easier to read. Complete: One click strikes through the line to indicate it’s completed. You also can choose to hide all the completed tasks. Search: The search of your list(s) is incredibly fast. This is key to finding the notes you saved. #hashtags: Using the # symbol turns the word into a linked tag that leads to a page with just the bullet points that have your #hashtag. Daily email: You can get an email with all the changes you made the previous day. If you use it to plan your day, this becomes a nice reminder of what you need to do. Export: This is a bit of a disappointment. It simply lets you copy the bullet points selected for export. Then paste the list into another document. Mobile: This is just a page on your mobile browser. But the tool is so minimal it’s hard to imagine needing more on your phone. 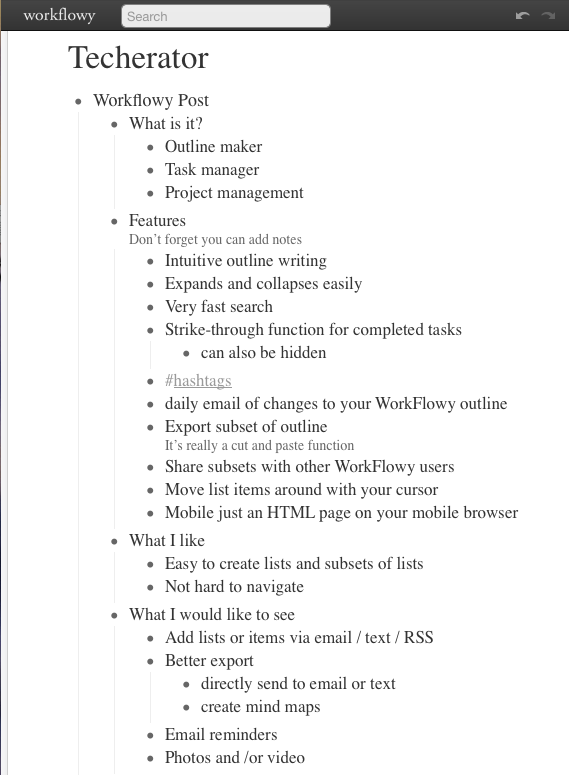 WorkFlowy is an incredibly easy tool that makes lists. As a writer, I use it mainly to create outlines and organize notes. The collapsibility and search make it easy to navigate so I can find everything easily. It’s my first step whenever I brainstorm projects or writing assignments. That said, there are a few things I would like to see added to its features. 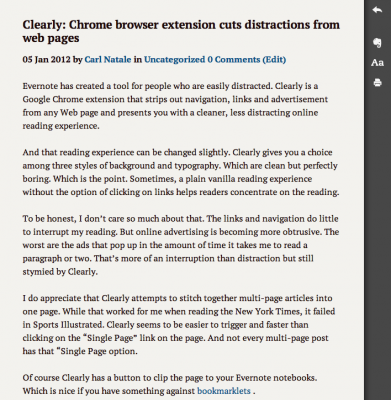 For example, I would love to add links and clip web pages from a bookmarklet. Think of it as a minimalist Evernote. I also would like to add bullet points or lists via email or text messaging. And not just text – photo and video clips would be handy. Maybe those are features that will ruin the simplicity, which would be a shame. That simplicity is probably WorkFlowy’s best feature. There are mobile apps that will help you improve your health, but what about when you’re sick or injured? You need to know what is wrong with you and where to get it treated (probably more important). Each listing has contact information and a map. This is a valuable tool for anyone in a new area who needs anything from a new primary care physician to an emergency room. You also can request an appointment with healthcare providers you find with the app. 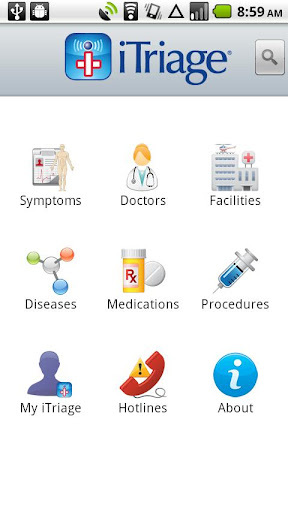 All listings, medicine and disease information can be saved on your phone. There also is the ability to save your insurance information. The app may be able to use the information to customize the advice hotlines you can call to get more information on your condition or finding medical care. iTriage is a handy app when researching medical information, but I wouldn’t use it to turn my phone into a medical tricorder and play doctor. The physician and hospital finding functions are extremely useful, but it wasn’t very useful for finding a primary care physician in my area. Warning: Excessive use can lead to cyberchondria. When Google launched “Search Plus Your World” (SPYW) it took a big step toward becoming the company that everyone loves to hate. By integrating search results from the Google+ network into your regular search, plenty of people cried foul. And not just the ones working for Twitter and Facebook. The idea is that Google+ profiles and posts may not be as useful as what those users post to other social networks, so fotu gives you the option of finding what’s in those social networks that are complaining about SPYW. They have a bookmarklet that will take any Google search result that is enhanced with SPYW and add links to timely, relevant information in other social networks such as Twitter, Facebook or Quora. As for me, I’m not convinced that this is the problem that fotu makes it out to be. Google has options such as “Verbatim” mode and “Hide personal results” that minimize SPYW, and the offending Google+ profiles don’t appear on every search. If you search for the word “politics,” you get three results linking to Google+ profiles. Search for “mitt romney,” there are none. 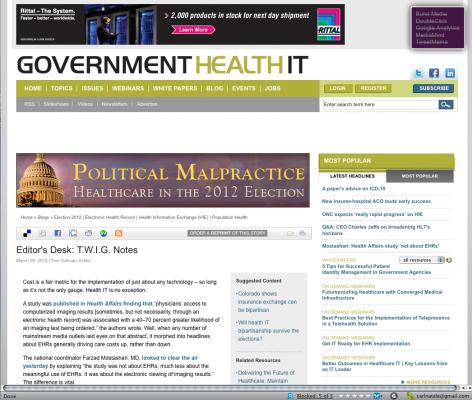 Unfortunately, the fotu bookmarklet doesn’t seem to do much to correct the problem. When you click on the bookmarklet (which is titled “don’t be evil”), you still get the same Google+ links but with other social network links. It still relies on Google to choose profiles from its Google+ social network. You will not get the chance to see the profile of someone without a Google+ profile. This will not be the SPYW killer that Google haters want. It’s a clever, simple tool that will help you find celebrities’ Twitter and Facebook accounts and demonstrate how Google results can be tweaked for other purposes. Otherwise, it doesn’t do that much. When Apple rolled out iBooks 2, it also released a tool to create interactive ebooks called iBook Author. It’s free and supposed to be easy to use. 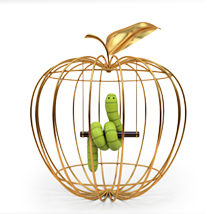 The catch is that you can only use it to sell books via Apple’s iBooks store, although you can use it to create ebooks that you can distribute for free. iBooks Author is an important tool because creating an ebook is a bit more complicated that exporting a Word document as a PDF. Self publishing services such as Lulu, Smashwords and Amazon’s CreateSpace, and Barnes & Noble’s PubIt! have free templates that you can use to create your ebook. Cover art is usually uploaded as a separate file. Your files are converted into the ePub format that will be readable by ebook readers such as Nook and Kindle. All this is free – that is, until you actually sell your ebooks. These services can take anywhere from 15 percent to 30 percent in commissions. While that’s more lucrative than royalties paid by traditional publishers, you may want to truly self-publish your books. There are tools that will export ePub and PDF formats, allowing you to sell your own ebooks and/or distribute through one of the services. PressBooks: This service is a WordPress blog that lets authors export books in ePub, Kindle, print-on-demand-ready PDF, HTML and inDesign-ready XML. eCub: This free app works on Windows, Linux, Mac, FreeBSD and Solaris systems. It’s a very basic tool without WYSIWYG. Sigil: Free WYSIWYG ebook editor works in Windows, Mac OSX and Linux. Jutoh costs $39 and is a WYSIWYG ebook editor imports text files or lets you create the ebook from scratch. It works in Windows, Mac OSX and Linux. Some word processing and design apps such as Atlantis, Adobe InDesign, Pages and Scrivener will export documents in ePub format. 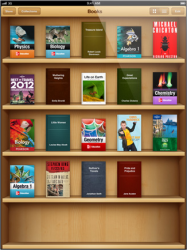 It may be worth your while to create your ebook with one of these apps before uploading it to an ebook selling service. They may be easier to use than the templates provided, and having your own ePub-formatted manuscripts give you more flexibility for selling your books. Finding the best spot for wifi access in your home or in a public place is pretty much trial and error. Turn on your laptop, and see what happens. NetSpot is a free wireless survey tool that makes it more of a treasure hunt. Once you install it on your Mac (OSX only), your laptop becomes a wifi sniffer. Before you start up the app, you’re going to need a floor plan with measurements. NetSpot includes some decent drawing tools so you can map out your area in a way that won’t gain you admittance to architecture schools. But you’re going to need to draw the floor plan to scale, which means taking measurements (or making the best educated guesses of your life). I’m lucky; my stepson is a CAD enthusiast who already created a map of the first floor of our house which I loaded into NetSpot. 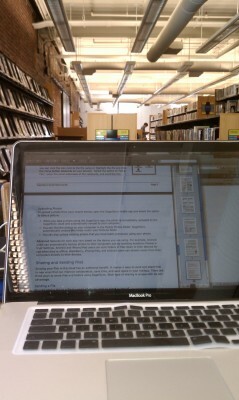 I then walked around the house with my laptop – stopping at strategic locations on the floor plan and clicking on them. Then waited a few seconds while the app scanned my wifi networks. In my mind, a strategic location was at a corner or doorway (which was detailed precisely on my floor plan). It required no guesswork or estimation on my part. Each click colored the area on the floor plan green. When I covered the entire floor, I stopped the scan to see what I got. The NetSpot app creates a heat map showing the signal strength of my wireless network at home. 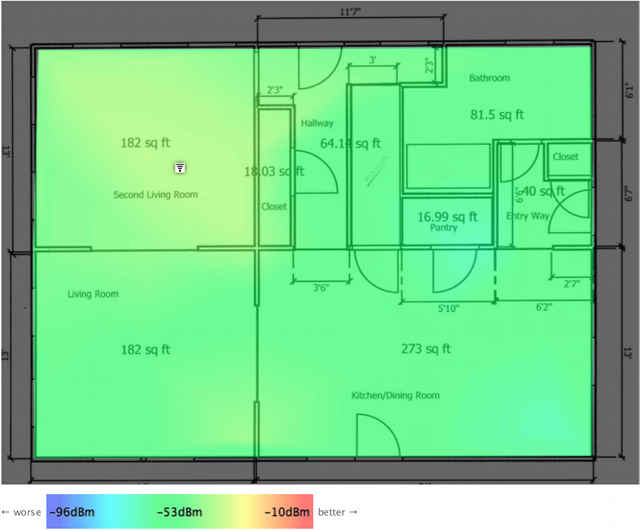 The dim yellow shading in the “Second Living Room” shows the strongest signal on the first floor, which is right below the wireless router upstairs. The worst spots are on the kitchen counter and in the bathroom (although these are still decent strength levels). The app also will create heat maps showing interference and signal noise. It’s a fun app that can be useful if you’re trying to figure out where to place your routers and work stations, but if I didn’t have a floor plan already, I would haven’t even tried the app. The work involved wouldn’t have been worth it. Your mileage may vary. One last note: I wish this was a mobile app. Sure, creating a floor plan could be ugly on a small screen. But walking around the house holding a laptop still is not easy on the arms.